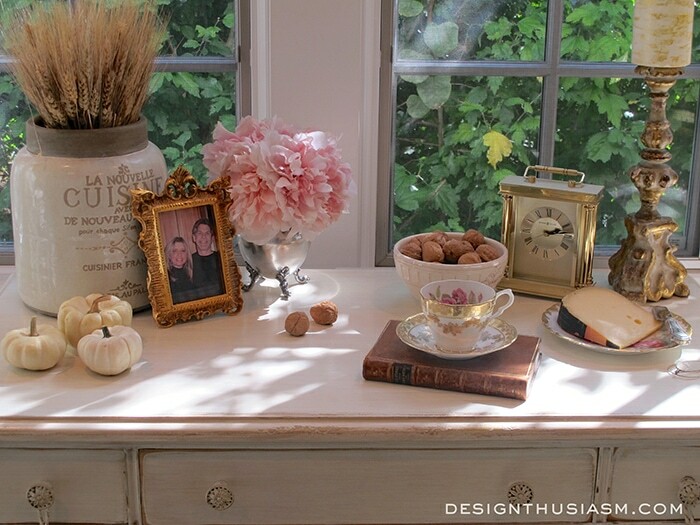 Welcome to Designthusiasm’s Fall House Tour! 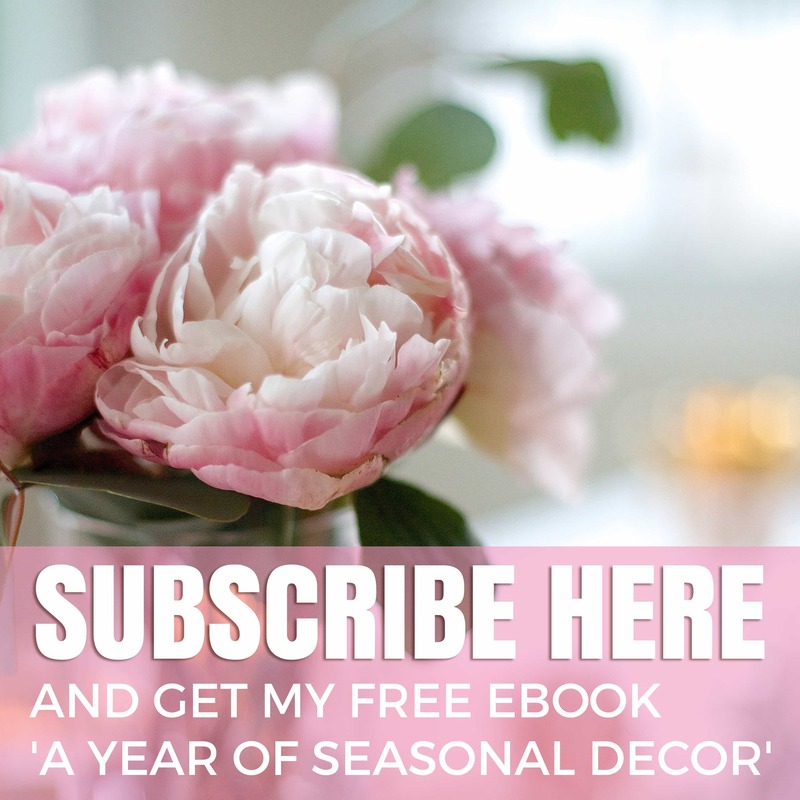 This tour first appeared on the blog Design Dreams by Anne, but since there is an entire section that some of my readers may not have seen yet, I’m posting it in its entirety here. While I’ve always been a big fan of warm weather, there’s nothing quite like the delights that autumn brings to our five senses. The colors, the aromas, the tastes and more, it’s a season that provides ample opportunity for celebrating life’s small pleasures at home. Pour yourself a cup of hot tea, wrap up in a soft blanket and enjoy the tour. For my entry, I decided to take a simple approach. A smattering of varied colored pumpkins encircle my vintage milk box. The brick pillars flank the stairs with huge mums found at a roadside farm stand. 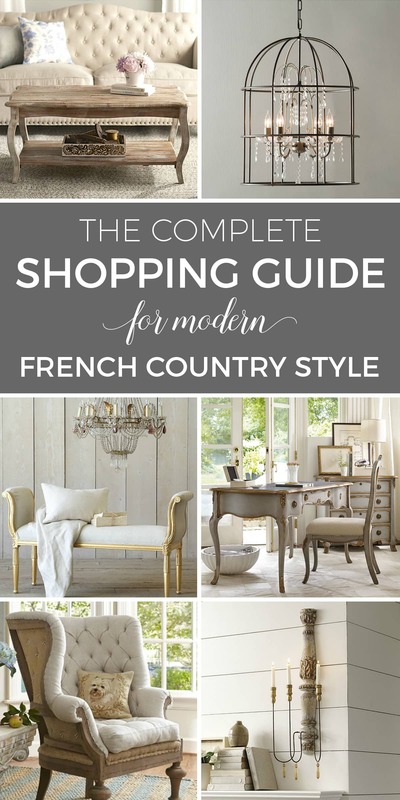 My entry is a mix of French Country and a touch of shabby chic. The chairs are Rachel Ashwell’s Darcy chairs and the chest is a chippy painted piece, but the marble floor and gilded mirror add a touch of elegance. 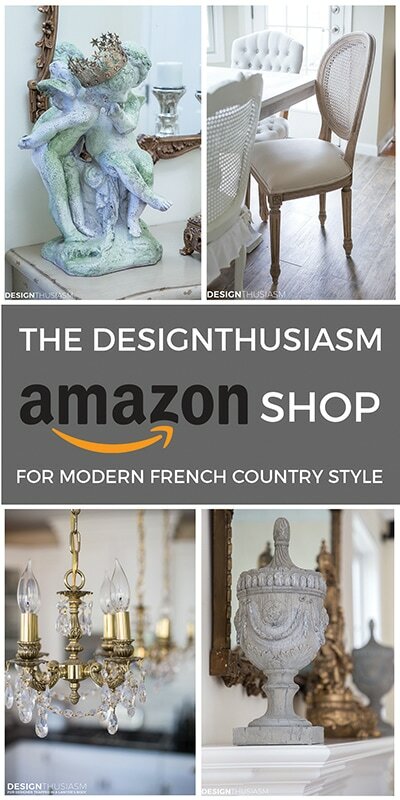 There’s also an antique bench across from this vignette and I use aubusson pillows and rugs to pretty up the space. For fall I’ve added the spiced potpourri and tiny white pumpkins. 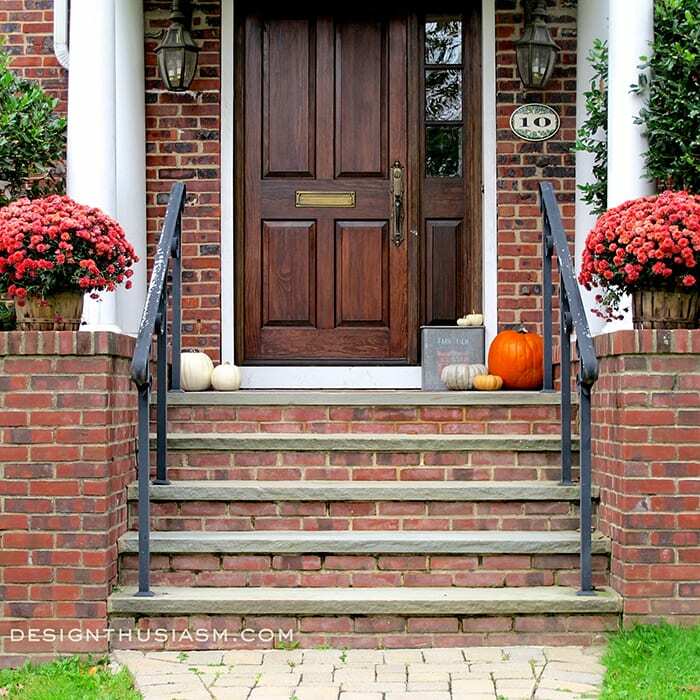 You can see more details on this space in my post HOW TO CREATE A WELCOMING FALL ENTRY. 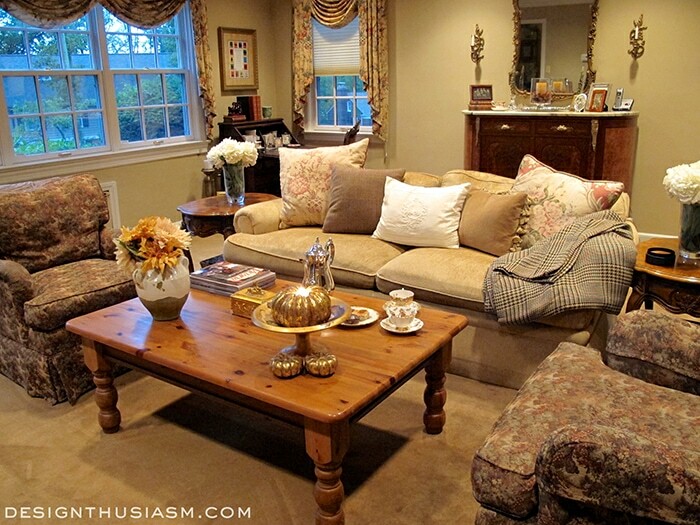 Next we move into the family room, which I’ve set up for an autumn afternoon tea. I have a bit of a love-hate relationship with this room. I really want it to be creams and whites, as with most rooms in my home, but I haven’t had the chance to change it over yet. 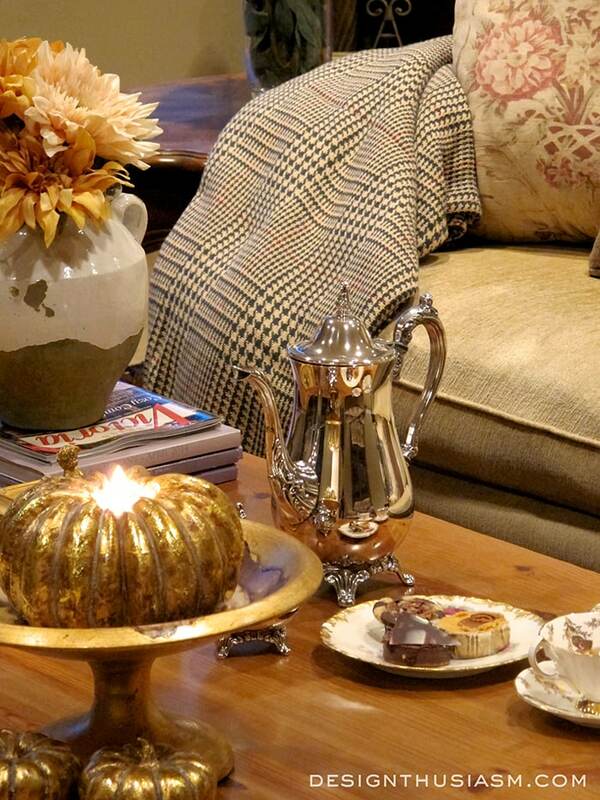 That said, the English library patterns and golden tones work well for fall. The one thing I won’t be changing are the hard pieces in the room, which are mostly antiques from England and France. The pillows here are from Ralph Lauren Home. I love the mix of masculine tweeds with feminine florals. The blanket throw and embroidered linen pillow are also RL, as is the fabric used for the window coverings. Tapestry chairs are from Henredon. Here I’ve placed my autumn tea setting. 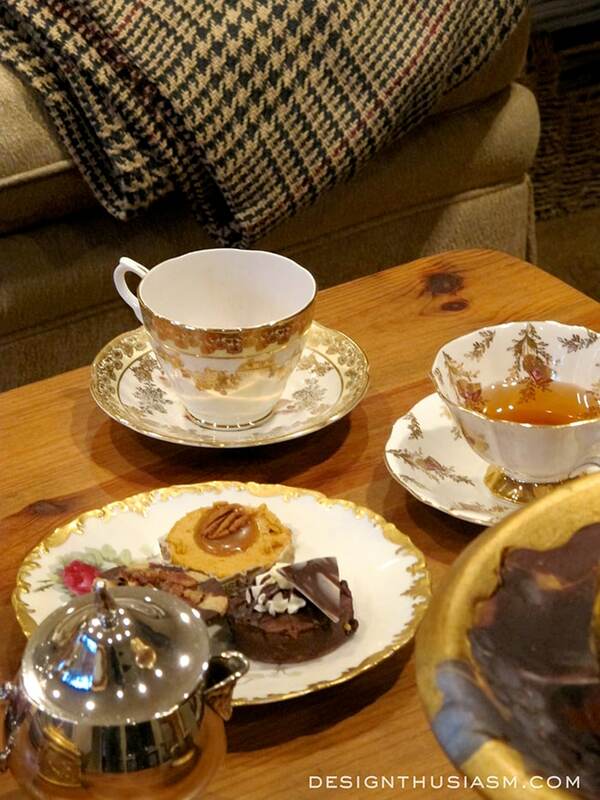 Teacups and cake plate are part of my vintage collection. The cakes are pecan, pumpkin with caramel and chocolate ganache. The flowers are faux florals, found at Pottery Barn. 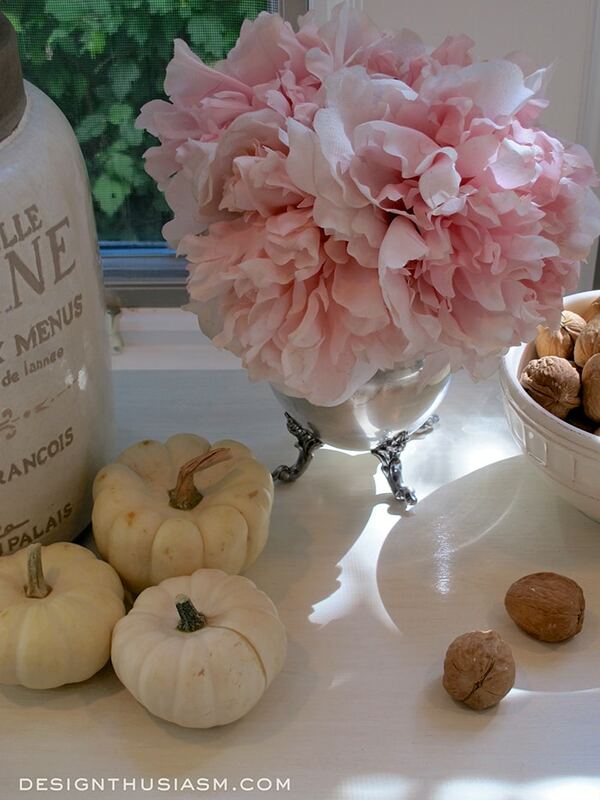 I’m a huge fan of fresh flowers, but I mix in the faux, as well. 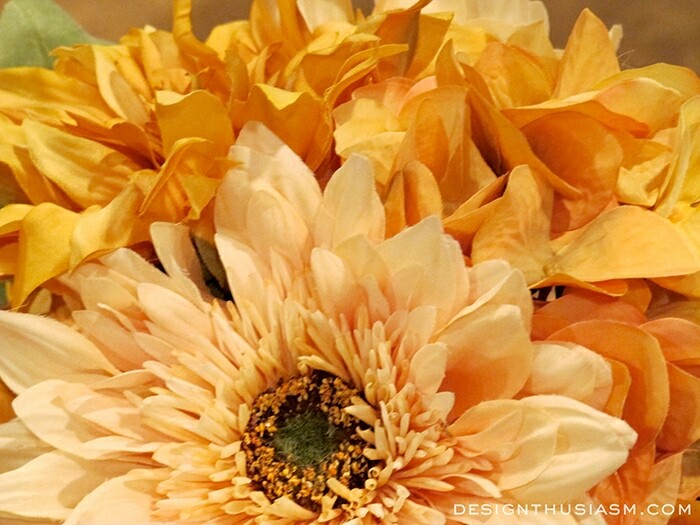 Sometimes the colors and varieties you want are just not available at the florist and these add a delightfully autumnal air to the room. This piece is probably my favorite piece in my home. You can get a better glimpse of it here in my LIVING WITH BOOKS post, as well as a library bookcase not visible in these photos. It’s a burled wood server from France and usually holds my tea set, but I’ve added the cinnamon candle and acorn bits for a fall touch, since the teapot is in use on the other table. Old family photos share the space for a note of warmth. 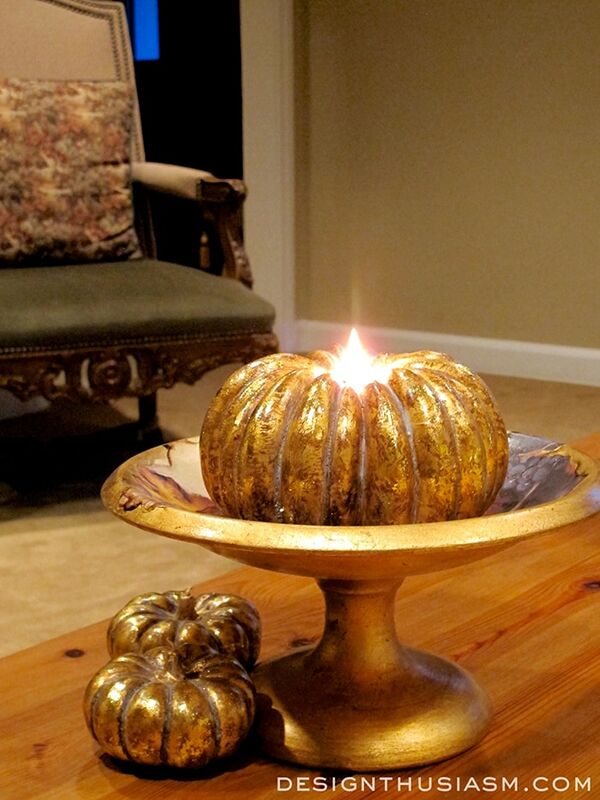 I love these gilded pumpkin candles and they add a lovely seasonal glow to the setting. 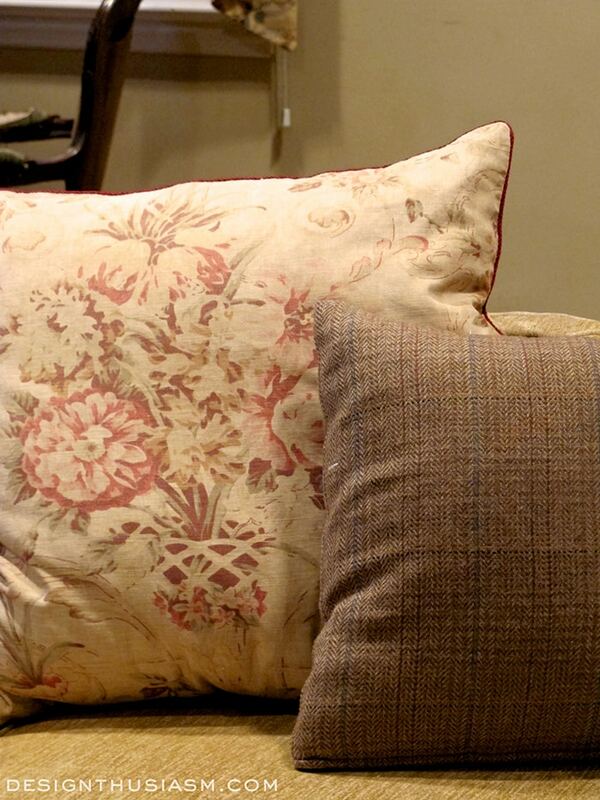 You can see my Lillian August chairs in the background with the tapestry pillows tossed on. In the corner of the room I have a round bistro table that’s often used for serving hors d’oeuvres or snacks. Here it’s functioning as a wine bar, with a few leftover bits from my HALLOWEEN WINE TASTING post. 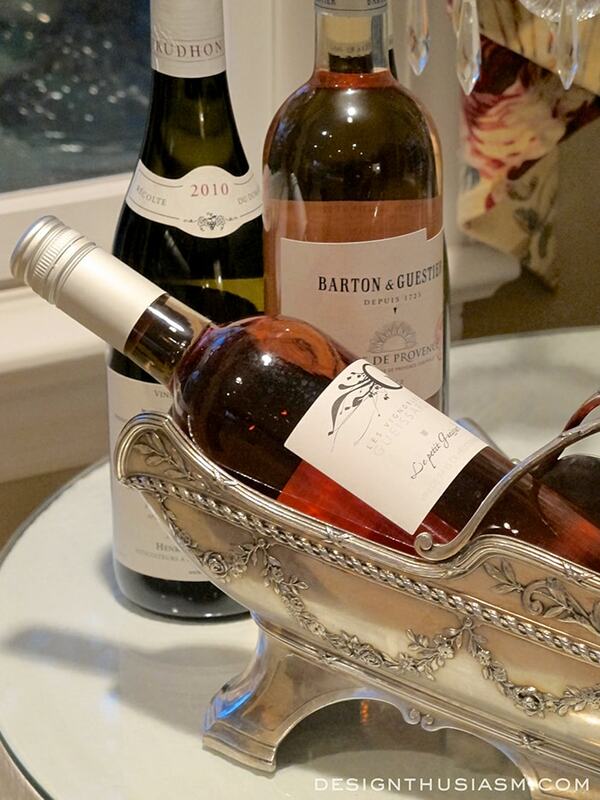 The silver wine caddy was purchased at a flea market in Villefranche-sur-Mer and has moved around my house holding various items, but rarely the wine it was meant for! 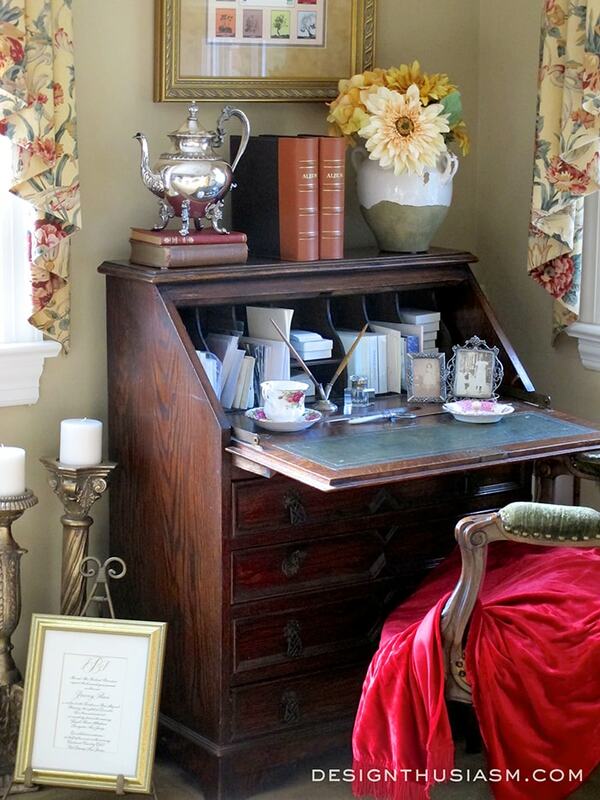 I love writing desks and have a few around my home. This one is English and was found in Lambertville, NJ. The blanket is covering an antique chair that is in desperate need of upholstering (like, we’re talking springs are practically showing!). One day I’ll get to it and it will make a wonderful post. The desk holds more vintage photos, books and teacups along with my latest find. The silver teapot I found last weekend at an antique mall in Bloomington, Indiana. It was completely black with tarnish and I spent a fruitful day shining the thing until it gleamed. You can read more about that endeavor in SHINING THE SILVER FOR THE HOLIDAYS. From here we can move into the kitchen, where I’ve added lots of autumn warmth. The island is decorated with a repurposed toolbox from Home Goods, filled with gourds and pine cones, and flanked by my spiced candles and acorn potpourri. I love the way the fall tones warm up the room. 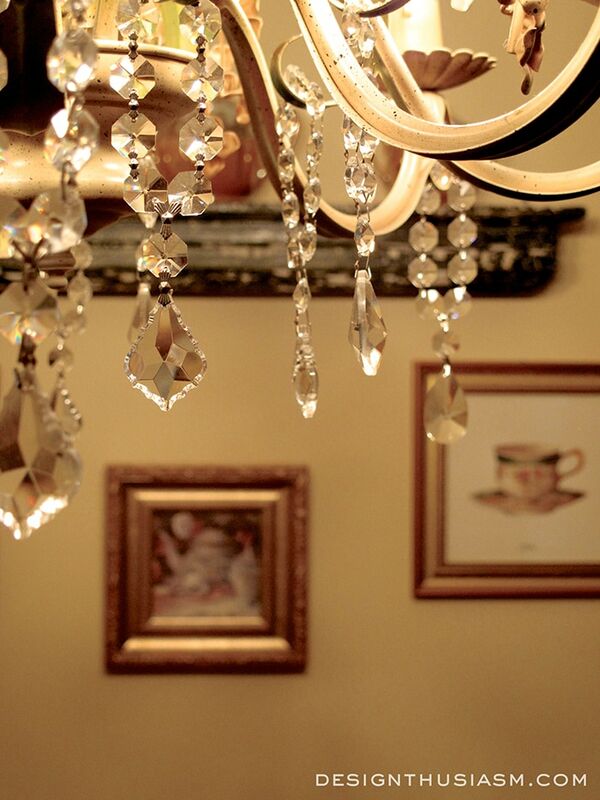 In the breakfast area, my floral chandelier is glammed up a bit with hanging crystal napkin rings. My ever-present teacups make an appearance here too, this time in small paintings on the wall. 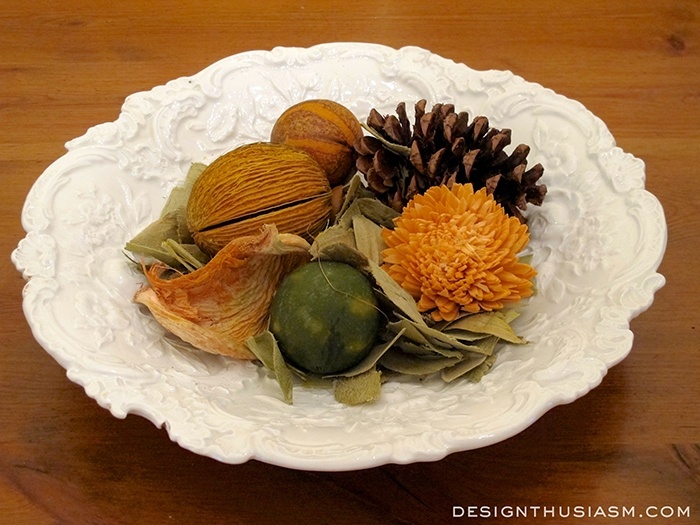 On my Pottery Barn table, I have an antique Dresden bowl with autumn potpourri, delightful for both it’s color and aroma. 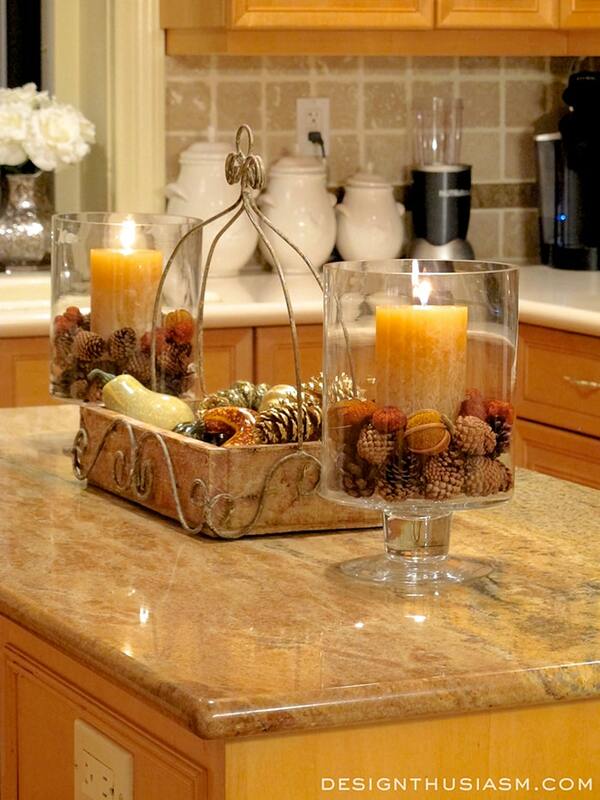 You can see all of my fall touches in my post 6 WAYS TO ADD AUTUMN WARMTH TO YOUR KITCHEN. Next we continue into the dining room, the room where most of my tablescapes are done. In this one, I’ve set it for a day after Thanksgiving lunch. 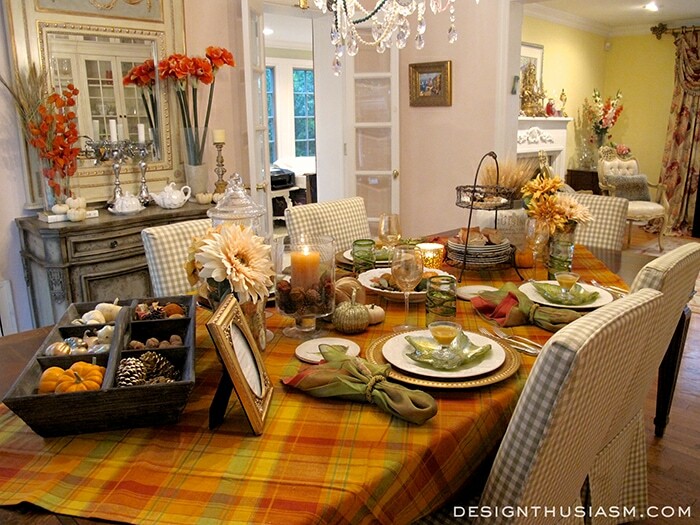 This setting incorporates almost everything one can think of to celebrate the fall season, beginning with the color palette, encapsulated in the plaid tablecloth. 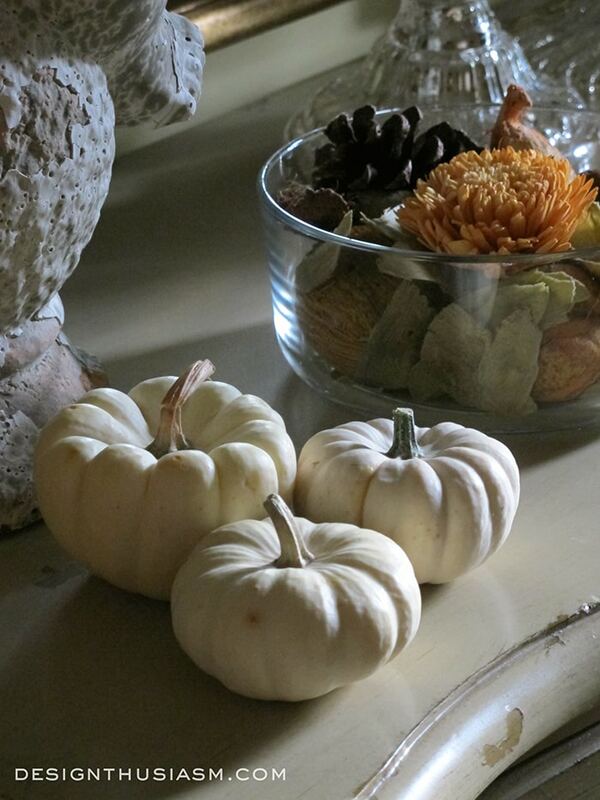 Even the sideboard is decorated with pumpkin ceramics, as well as real mini pumpkins. The concept for this lunch revolves around leftover turkey tucked in delicious sandwiches and served with butternut squash soup and sweet potato chips. You can see the rest of the details here, in my post DAY AFTER THANKSGIVING LUNCH. 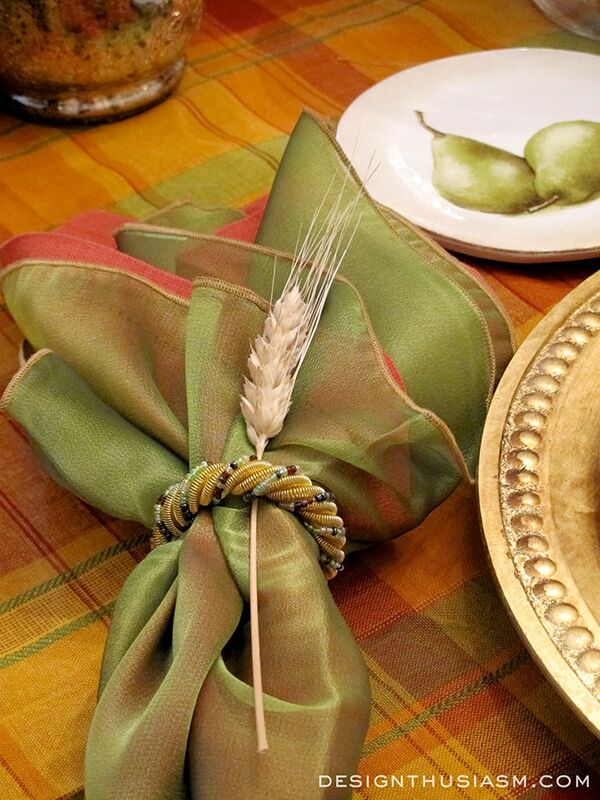 For napkins I layered colors pulled from the surrounding decor and tucked a wheat stalk in for a playful punch. The dining room leads into my living room, where you can see my fall mantel. 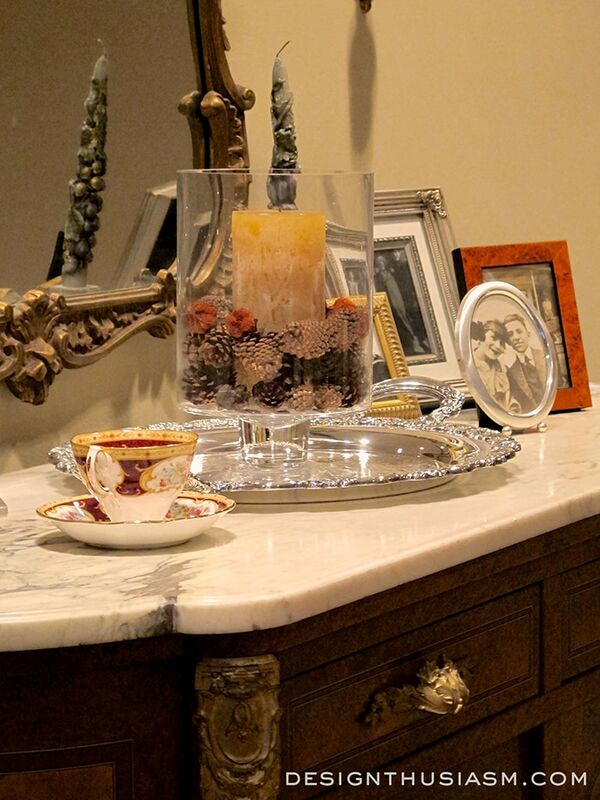 I worked with repetitive images of bronze glasses filled with orange roses, flanking the baroque gilded mantel clock. Rosé wines and Chinese lantern branches finish off the mantelscape. An extra bit of warmth is added by the fireplace candelabra. Here’s a close up look, but you can also see more photos and details in my post 3 STEPS TO A SIMPLE BUT ELEGANT FALL MANTEL. 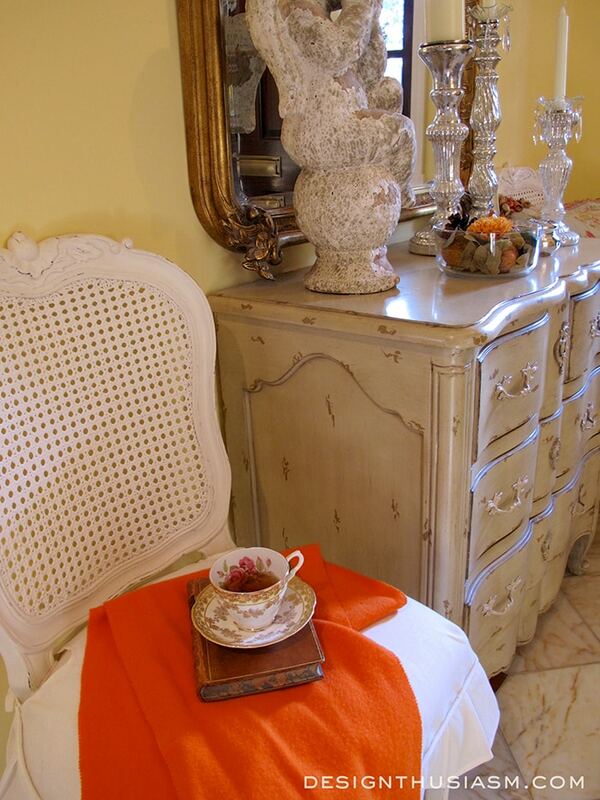 I also set a Halloween vignette on an antique chest in the room, utilizing the colors of the holiday. 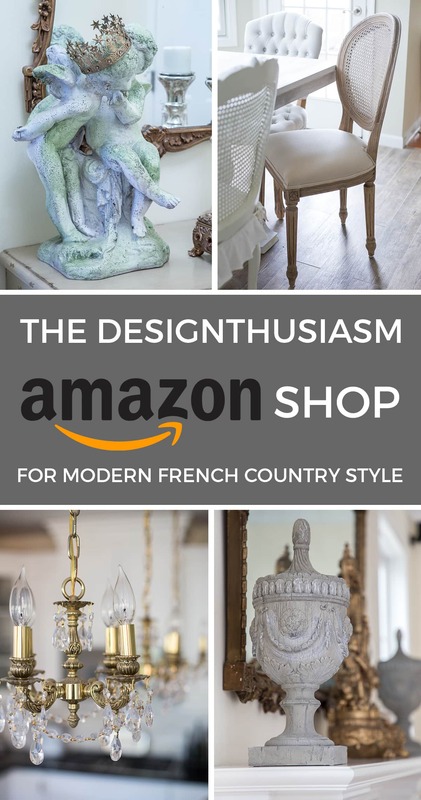 You can read about this one in detail in my HALLOWEEN HOUSE TOUR post, which also contains some of my FRENCH COUNTRY HALLOWEEN table setting in it. This post would have been too long to include it all here. Finally we come to my library which is where my desk is located. 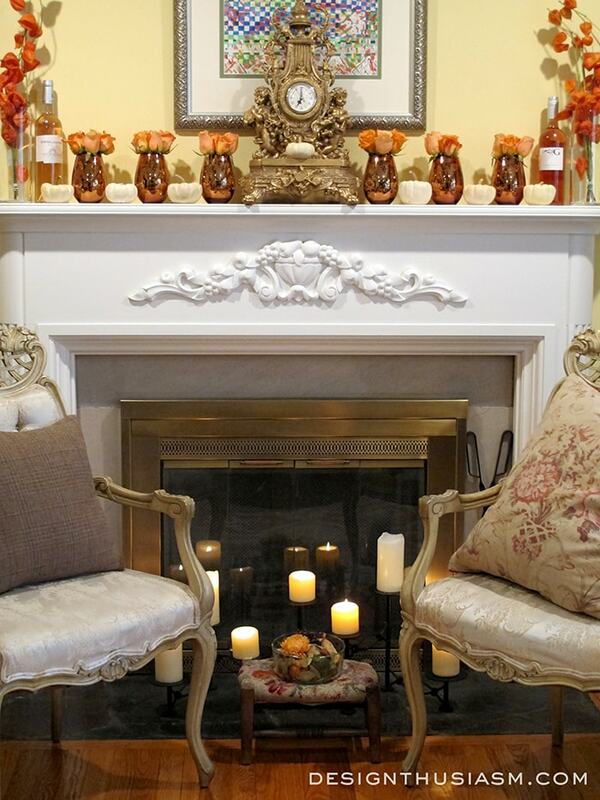 This is actually the first part of my home that I decorated for fall, so you can see I was just transitioning to the season here, with lighter colors and small seasonal touches. 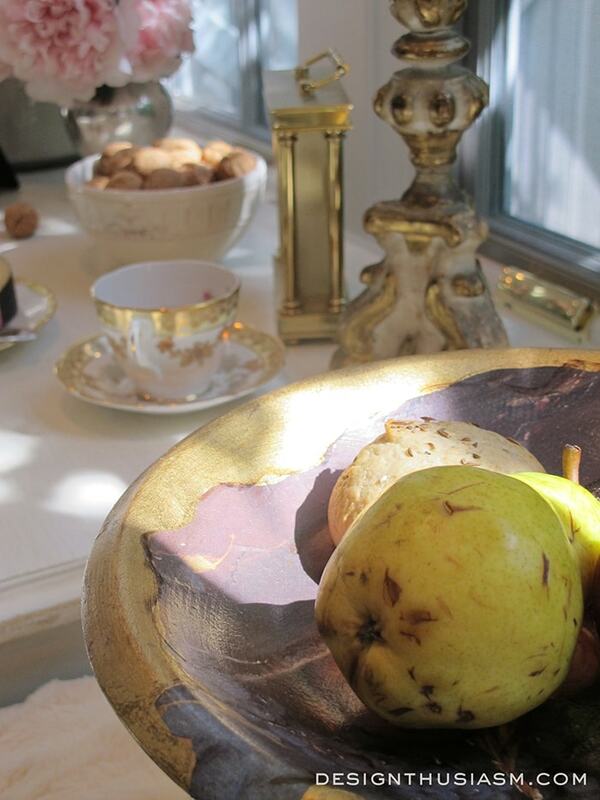 I often decorate with food, so the pears and plums as well as bowl of walnuts worked perfectly for this vignette. 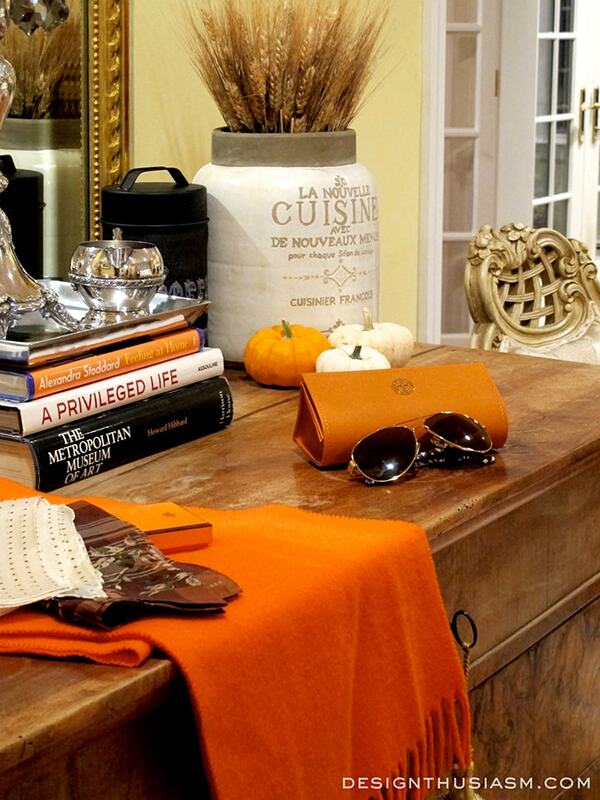 This is where my mini pumpkins first showed up and you can see more of this room in my post 5 FALL DECOR TIPS FOR YOUR DESK. Thank you for joining me on this fall tour of my home. I hope you enjoyed, as it’s time to move on to the next season! Lovely, Lory! Each room is so tastefully done. 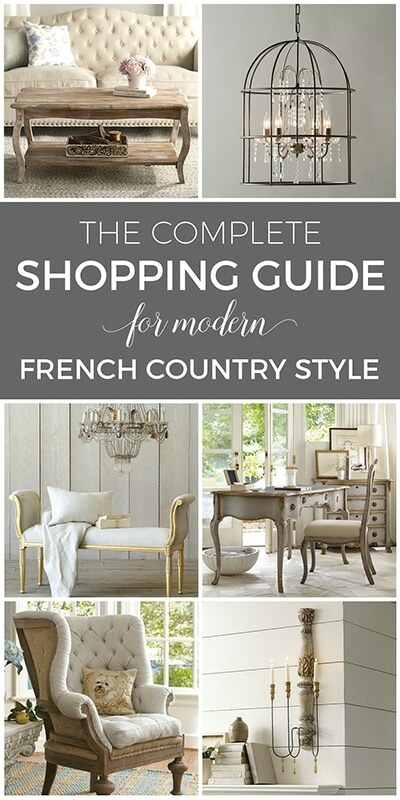 I love the mix of casual and elegance in your home. I’ve got a bit of a fetish when it comes to writing desks, and have 3 in my home that I love. 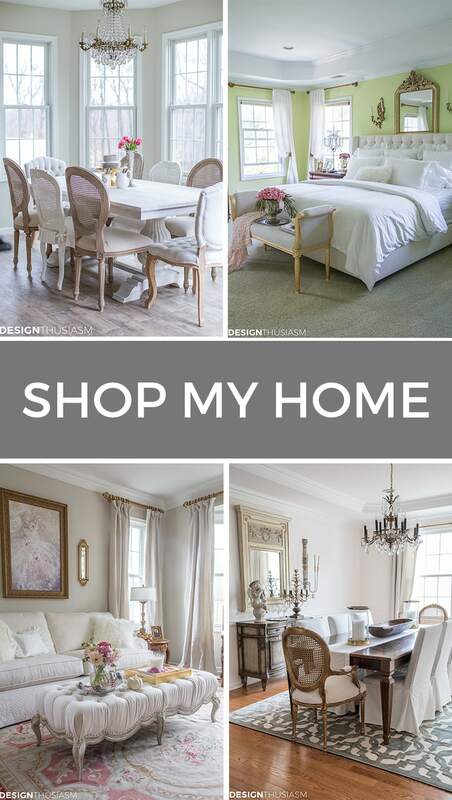 I have a love/hate relationship with my gold-painted living room and dining room, which I desperately want to paint, but can’t decide on a color (I want a neutral). Someone gave me that exact bag of potpourri, which I’ve just shown in my Thanksgiving lanterns. Thanks Amy! Yes, I’m all about the writing desks too… 🙂 And the love/hate relationship thing… that’s what spurs us on to new and different things. Looking forward to seeing what we both come up with… lol!! You have a very beautiful home and I thoroughly enjoyed the tour! 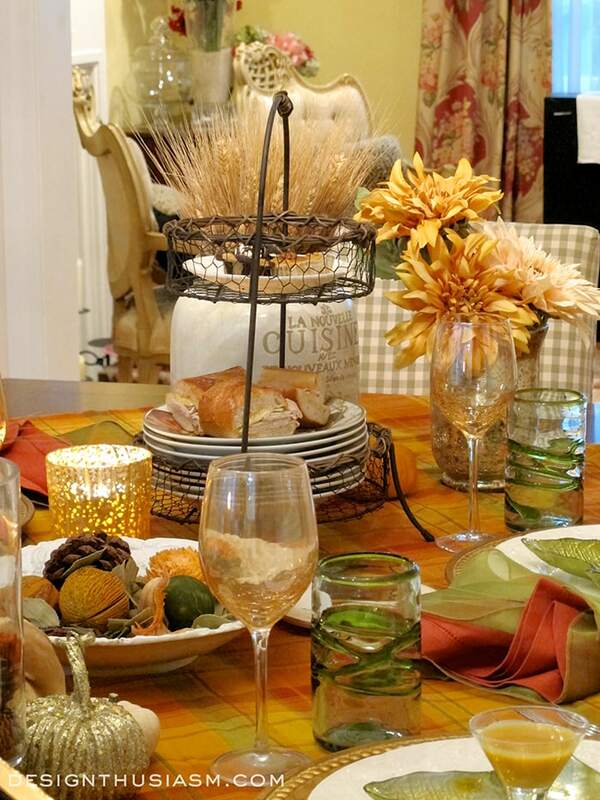 The plaid tablecloth is perfect along with all of your Fall touches! Thanks for sharing it with Share Your Cup. Thank you so much, Jann! 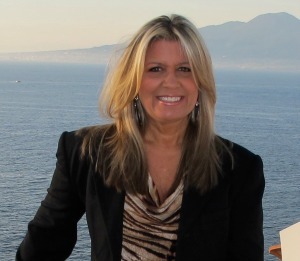 Thanks for stopping by to comment and for hosting Share Your Cup!! Thank you so much, Kathy!! 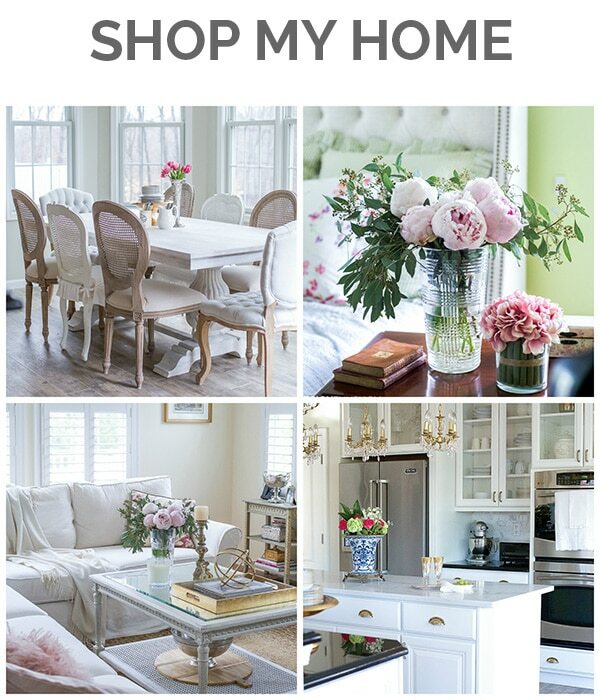 Your home is so pretty Lory! I love writing desks, that just hasn’t happened yet for me. 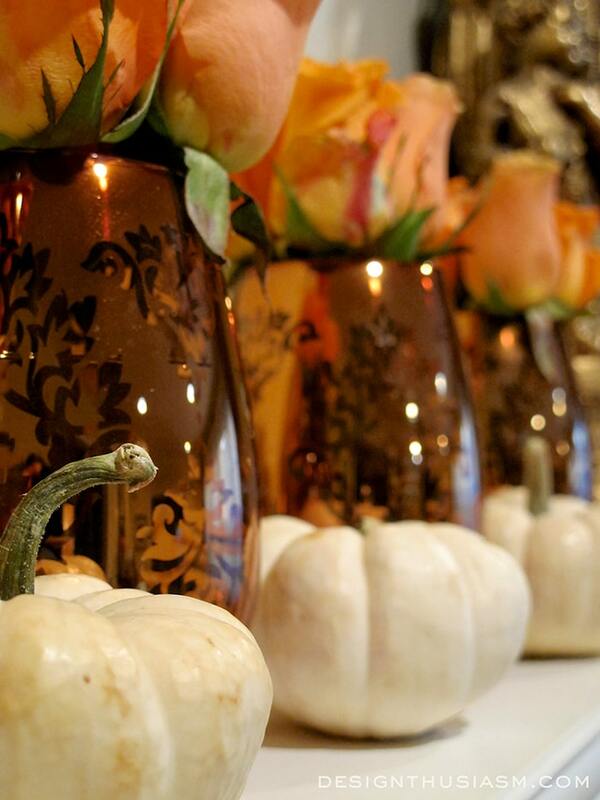 I am loving your mantel with the flowers and pumpkins lined up. I have to say out coffee tables are almost identical! However I am going to do some sort of paint treatment on mine. I had a concrete cherub that scratched it, well it didn’t I did! … hello Lory, all your decorations are lovely… I love your desk …..the walnuts and cheese and fruit , and the large jar are beautiful…. I don’t do Seasonal decorating as here in Australia we tend to just ‘do’ Christmas…. Thanks Barb! I definitely have begin decorating more seasonally since doing the blog, and I really enjoy living this way… 🙂 Thanks for stopping by!! 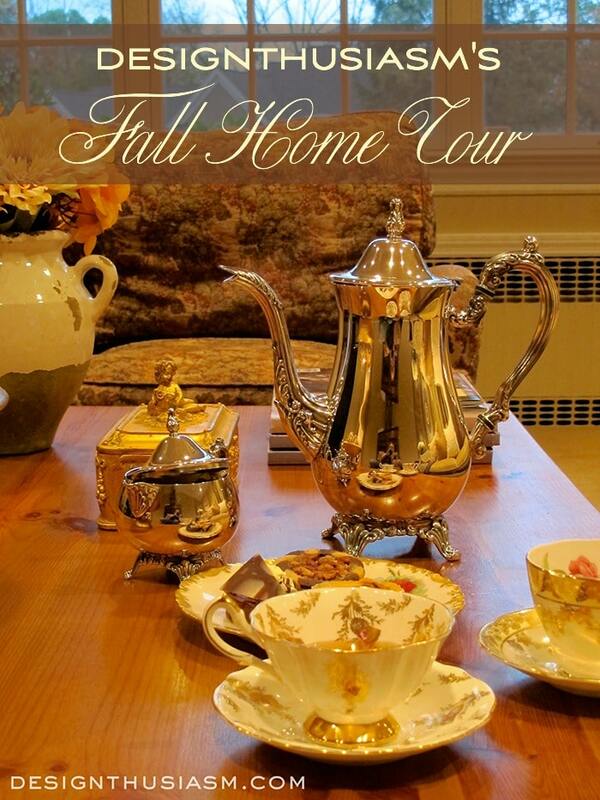 Your fall home tour was beautiful… you have a beautiful home!